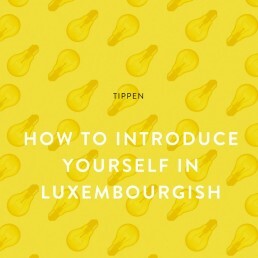 One of the most useful Luxembourgish phrases that beginners and travelers should learn is “ech hätt gär…”. This little phrase can be used when you’re out in a bakery or in a café ordering food or drinks, or in everyday conversations when you need to ask for something (for example an appointment) or make a little polite request. In this short lesson, you’ll learn how to use “Ech hätt gär… “ as well as try some examples. 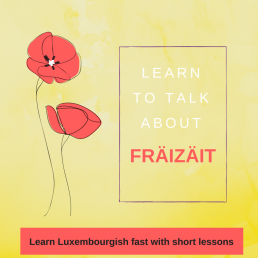 The full lesson for this topic which includes a video track, useful vocabulary to order food and drinks, grammar tutorials plus writing and listening exercises can be found in the online course Easy Luxembourgish Level 1. To order something politely in a shop or in a café you would say ech hätt gär which literally is “I would like to have”. Hätt comes from the verb hunn so “to have” and hätt is the subjunctive tense. Use the subjunctive tense when you want ask something politely. Ech hätt gär is ALWAYS followed by a noun and never by a verb!!! Ech hätt gär e Bouquet Blummen. – I would like a bunch of flowers. 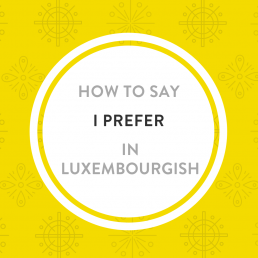 wann ech gelift is the expression that is used (in formal and informal situations) to mean “please” in Luxembourgish. You can practice how to pronounce “ech hätt gär…” by listening to this lesson on my youtube channel. Ech hätt gär 4 Bréidercher, wann ech gelift.➝ I would like 4 buns, please. D’Anne: Gudde Moien. Ech hätt gär e Croissant, wann ech gelift. – Hello. I would like a croissant, please. De Bäcker: Et deet mer leed, et si keng Croissantë méi do. – I am sorry, I don’t have any croissants left. D’Anne: Dann hätt ech gär eng Schockelasrull. – Then I would like a chocolate croissant. De Bäcker: Soss nach eppes? – Anything else? D’Anne: Jo, ech hätt och nach gär e Bréitche mat Kéis, w.e.g. – Yes, I would like as well a sandwich with cheese, please. Ech hätt gär e Plang vun der Stad, w.e.g. – I would like a street plan of the city, please. Meng Kanner hätte gär en Hond. – My children would like a dog. Ech hätt gär e Rendez-Vous beim Dokter Back. – I would like an appointment with doctor Back. Ech hätt endlech gär meng Rou! – I finally would like to rest! REMEMBER THAT hätt gär is ALWAYS followed by a noun! Do you want more short lessons like this? 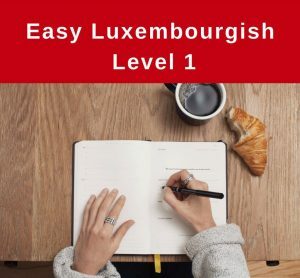 You can get more daily lessons together with exercises and lots of video support and grammar tutorials with my online courses Easy Luxembourgish. We have Level 1 for complete beginners and level 2 for more advanced learners. Check it out HERE!